What did I do at work today? Shuttled DNA into bacteria. Dipped arabidopsis plants into bacteria. Meeting. Another meeting. Another meeting. Oh, and I made a balloon kebab! Because I can! Just kidding. Because we will be at the Oxfordshire Science Festival Launch Event on 3rd March, Bonn Square. 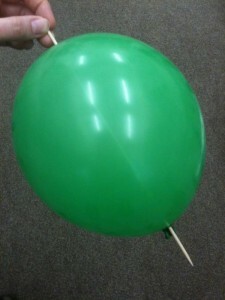 If, like me, you have a slight phobia of popping balloons, this might as well be the most exciting thing you do all day. My hands were sweaty afterwards, and so were my colleague’s, who was watching me do it!